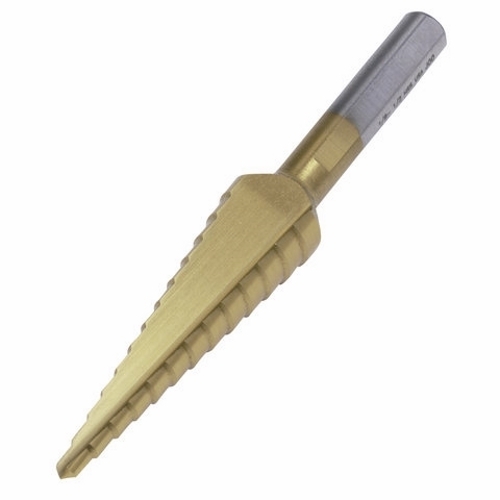 IDEAL step drill bits for precise, repetitive drilling through the toughest materials including brass, carbon steel, cast iron, stainless steel, and more. These tough and reliable tools are constructed with a rugged titanium nitride exterior coating for protection, edge retention and corrosion resistance. Each step is gradually blended to ease stepping through hole sizes; reducing the need to keep changing drill bits. Split point design eliminates the need for a starter hole or punch and delivers three times faster starts, saving valuable time. The double-fluted design provides balanced cuts, more cutting surface compared to a single flute design, and cooler operation.